Medium Voltage Switchgear Market Size in 2018 surpassed an annual installation of 7 million units and is anticipated to exceed USD 50 billion by 2025. The switchgear industry has witnessed robust growth on account of increasing electricity demand along with rising need for effective transmission and distribution control systems. Growing concerns associated with electricity supply faults, health, fire and other operational hazards along with lack of effective electrical infrastructure across developing economies will drive the global market. In addition, cost effectiveness, ease of installation, safe & reliable operations are certain prominent parameters positively influencing the business outlook. Ongoing commercialization with an aim to upscale the overall economic growth favoured by FDI schemes to support commercial & industrial establishments will augment the demand for primary and secondary distribution infrastructure. Henceforth, rapid digitalization across the industrial peripheral in conjunction with increasing energy demand from communication base stations & data centers will complement the medium voltage switchgear market. Voltage rating acts as a standard protocol for the deployment of switchgear units across residential peripherals, utilities and large-scale industries. 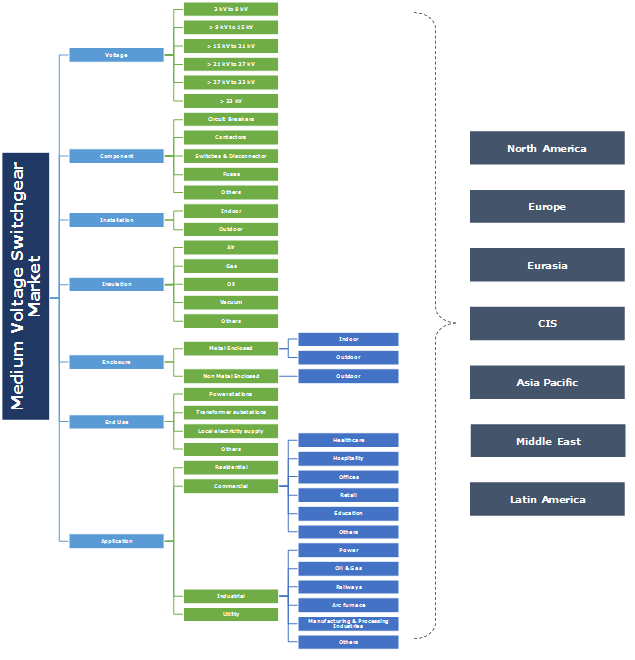 9 to 15kV MV switchgear market in the recent years have gained significant growth on account of large-scale commercial expansion and refurbishment of small-scale industries across developing regions. Product versatility, diverse applicability and aesthetic proximity are a few indispensable parameters influencing the demand for circuit protection devices including circuit breakers, switches and disconnectors. Industries and utility-scale installations deploy electrical lines with high voltage which require effective electrical components to avoid fluctuations which in turn will complement the MV switchgear market. Outdoor medium voltage switchgear market is anticipated to exceed USD 40 billion by 2025. Increasing deployment of on-site generation systems coupled with expansion of utility-based distribution networks will amplify the industry potential. In addition, outdoor units minimize fire and associated hazards, supplementing a safe and reliable operational environment. 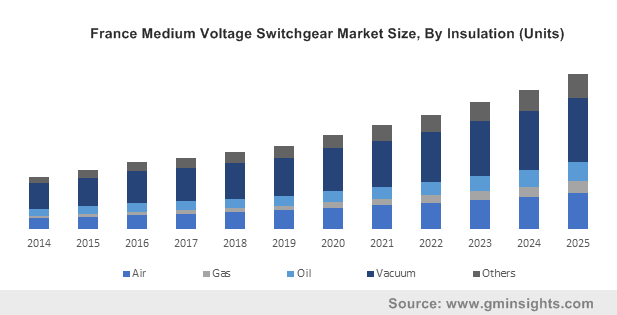 Vacuum insulated medium voltage switchgear market holds the maximum share owing to lower competence from other manufactured insulation technologies and higher consumer reliability. These units have gained an upsurge on account of their overall lifetime cost, safe & reliable operations and anti-leakage configurations. Although, these units incur higher initial costs when compared to other insulation technologies however, utility preference & consumer inclination has positively influenced its deployment subject to longer lifecycle and lesser maintenance costs. Metal enclosed medium voltage switchgear market is predicted to surpass an annual installation of 5,000 ‘000 units by 2025. Unique design & construction, safe & reliable operations, easy replacement and appropriate interlocking arrangement between different components are the essential factors driving the product demand. In addition, growing concerns to curb fire hazards, short circuits, and electricity supply faults have further amplified the industry share. In the current industrial regime, switchgears on account of their varied voltage levels and diverse applications across power stations and transformer substations have gained prominence nurturing the global MV switchgear market. Moreover, rising electricity demand in line with stringent regulatory schemes to create an energy efficient environment have instituted a favourable business scenario. Increasing focus on conserving and ensuring uninterrupted power supply, power stations have aligned their focus towards advanced & smart technologies which in turn will further complement the business outlook. Large scale suburban migration along with favourable regulatory measures to ensure a healthy livelihood for domestic residents have led to urbanization and commercial expansion across the globe. The apparent rise in peak load demand has compelled utilities and installers to upgrade and upscale to versatile electric supply components to ensure grid reliability & security. Henceforth, rising energy demand favoured by growing demand for effective power distribution networks will favour the MV switchgear market share. 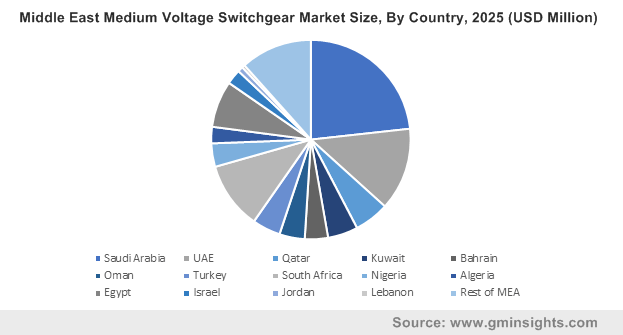 Growing demand for restoration & refurbishment of existing electrical setup coupled with increasing investments across the energy sector will complement the North America MV switchgear market. Economical costs, reliability & longevity, along with operational flexibility are some of the essential parameters projected to escalate the industry growth. The U.S. Government in 2018 introduced plans to capitalise an amount worth USD 10 billion to supplement its inter-regional electrical infrastructure with an aim to curb the curtailment rate of the Western Transmission & Distribution Network. Prominent market participants include ABB, Siemens, GE, Mitsubishi, Schneider, Ormazabal, BHEL, Crompton Greaves, Chint Group, Eaton, Hyosung, Hyundai Heavy Industries, Lucy Electric, Powell and Toshiba. Technological collaborations, application focussed R&D, and product assortment have been the primary strategic inferences as followed by the leading industry players. Medium voltage switchgears are devices which help in stabilizing the voltage interruptions and the unsteady flow of power. It offers shield to the interconnected components by metering, regulating and controlling the flow of electricity across the distribution management system.